Myocardial Infarction is irreversible death of Heart Muscle due to lack of oxygen supply to it. It is known by another common name Heart Attack. All of us know that heart supplies blood to all organs by pumping it into arteries. But some of these arteries also carry blood to walls of our heart to make its muscles work properly and keep pumping. But when plaque buildup inside any such artery and causes complete blockage of blood to certain heart muscles then it is Heart Attack. Our heart muscle can bear this blockage for certain amount of time, but if its more than that, then those muscles become permanently dead, which is Myocardial Infarction. The very first symptoms is chest pain and feeling of discomfort. If this discomfortness and pain travels into shoulder, arm, back, neck or jaw, then you can be sure that its a heart attack. These symptoms last for more than a few minutes. If you notice such symptoms then you need immediate medical attention. You may also feel shortness of breath, cold sweat and feeling faint. 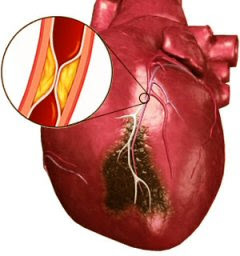 Myocardial Infarction Diagnosis is done by examining the symptoms and connecting them with physical examination. ECG Report, Blood Test Report and Heart Muscle Cell Damage are other important part of Myocardial Infarction Diagnosis. Coronary Angiogram is another modern diagnosis method which allows visualization of Heart Arteries and check them for obstruction. Myocardial Infarction is done by both lifestyle changes and Medication. If we talk about lifestyle changes then its the most important part of treatment. It decreases the chances of heart attack. Lifestyle changes include both changes in diet and physical activity. Its better to consult a doctor for correct medication and physical activity routine. Physical activity routine depends on the degree of damage done by Myocardial Infarction. Changes in Diet are also important. Your doctor may advise you to increase the consumption of wholegrain starch and decrease consumption of sugar and salt. There is some effect of dietary fat in this medical condition. But still doctors advice to stay away from saturated fat and use only unsaturated fat to decrease to deposition of cholesterol in blood vessels. Myocardial Infarction risk factors are same as any other heart disease. Some of them are listed here. If you have any of these risk facts then its better consult a doctor and get yourself checked on regular basis. Here are the risk factors. Men above 45 Years and Women above 55 Years of age.